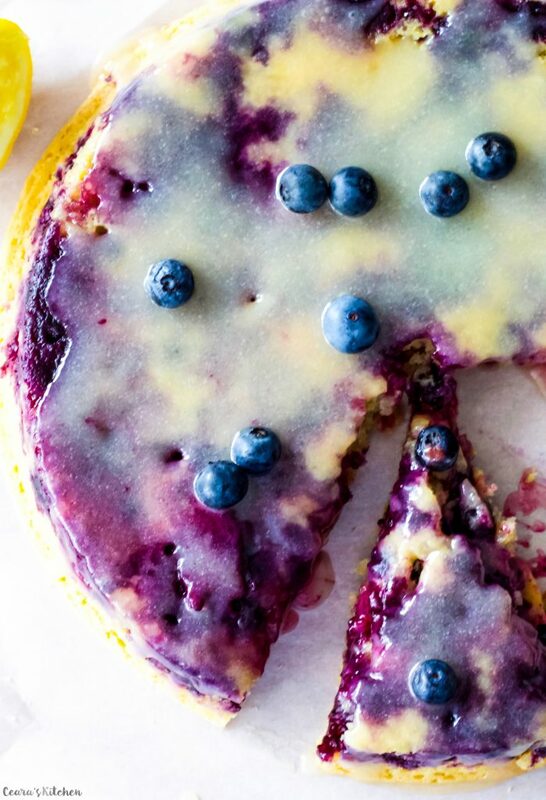 A moist, soft and sweet Vegan Lemon Blueberry Cake made with fresh lemon juice and ripe blueberries. Topped off with a “one-minute” lemon glaze. If Summer was a cake, this would be it!! How are you guys doing? Care to join me for some La la la Lemon Blueberry Cake? My favorite cake of the Summer by far. And I don’t say that lightly. This Lemon Blueberry Cake is soooo incredibly moist, soft and tasty. And it’s supeeeeeeeeer lemony with lots of bright, purple blueberries mixed in! If you make this Vegan Lemon Blueberry Cake at home, take a photo and tag me #CearasKitchen on Instagram or leave your feedback below. Top with my “One Minute Lemon Glaze”. You are going to want to put this 3-ingredient lemon glaze with everyyyything all Summer long. And eat warm… or cold for breakast, dessert, or dinner. Enjoy! And have you heard? 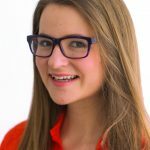 I am hosting a Plant-Based Picnic in the Park soon! You are invited. Find the details here. A moist, soft and sweet Lemon Blueberry Cake made with fresh lemon juice and ripe blueberries. Topped off with a “one-minute” lemon glaze. If Summer was a cake, this would be it!! Preheat the oven to 350F. Line a 9 inch round baking pan with coconut oil spray. Mix the dry ingredients (flour, sugar, baking powder, and sea salt) together in a large bowl. Stir in blueberries until they are covered with the flour mixture. If your coconut cream is separated, take it out of the can and blend it so it is combines into a creamy mixture. Whisk the wet ingredients (lemon juice, zest, coconut cream, and vanilla extract) together in a medium bowl until creamy. Create a well in the middle of the dry ingredients. Pour the wet ingredients into the well. Fold the wet ingredients into the dry ingredients until just combined. Pour the cake batter into the pan. Smooth out the top with a wooden spoon. Bake for 35-40 minutes until an inserted toothpick comes out clear. 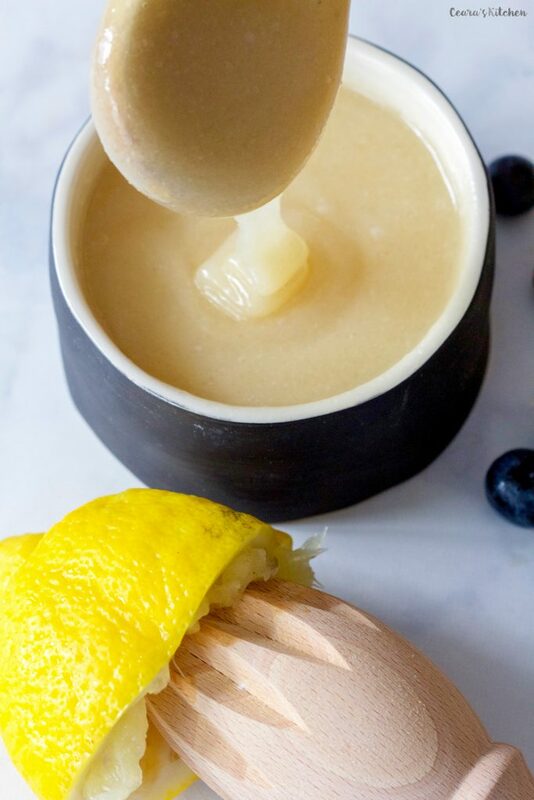 For the [b]lemon glaze[/b], while the cake is baking in the oven, whisk the lemon glaze, cane sugar, and melted coconut butter together until creamy and smooth. Leave the cake to cool for 20 minutes before removing from the pan. To remove the cake from the pan, carve around the cake with a knife to remove any cake sticking to the side of the pan. Place a large plate on top of the cake. Quickly flip the cake over and tap the back of the pan to release the cake from the pan. 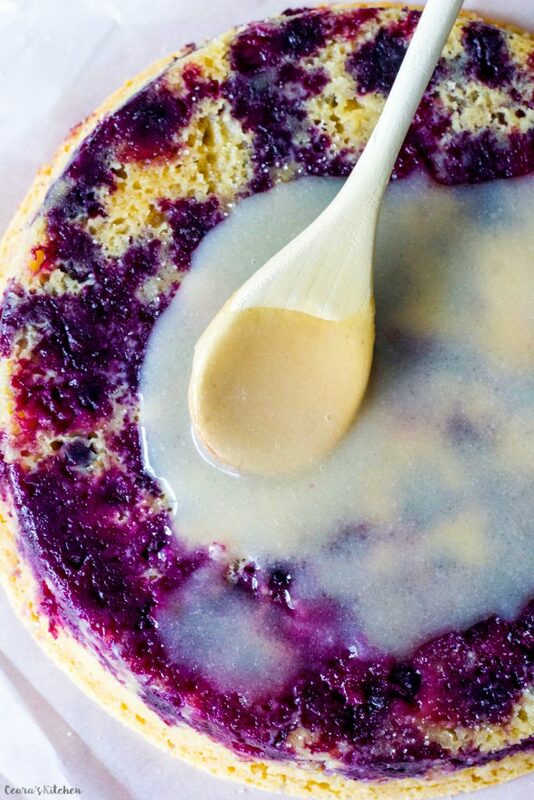 Leave the cake to cool for 10 more minutes before topping with the lemon glaze. 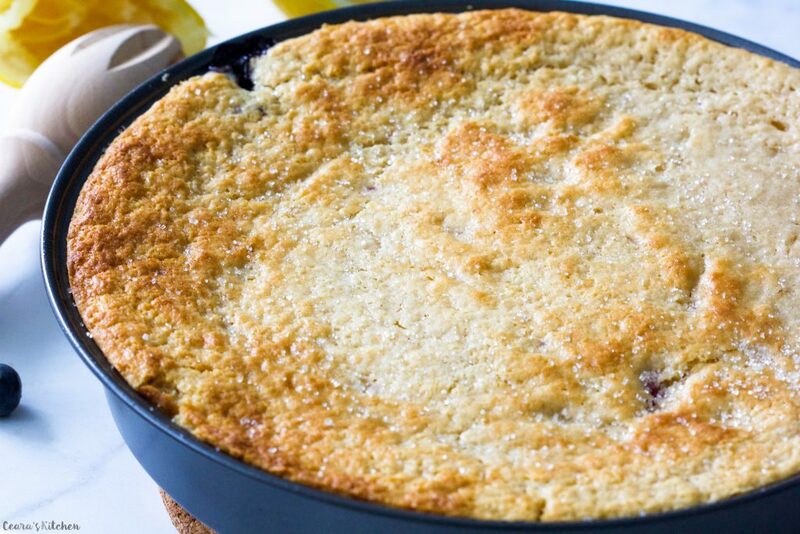 Sprinkle cane sugar and blueberries on top. 1) Sub whole wheat pastry flour for organic all purpose flour. 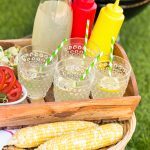 *Upcoming Event* Plant Based Picnic In The Park! This is AMAZING! So delicious, everyone loves it. I thought that it would be too lemony, but it wasn’t. Hye Ceara. Ive made the lemon blueberry cake as per your recipe and it is having an acidic taste…like citric acid. Note that i had put 1/3 cup fresh lemon juice (80 ml) just like you instructed. Should the quantity be reduced? Our entire family loved this cake & can I just bless you for making it so healthy!! I opted for a coconut whipped cream topping instead of the glaze, but I know yours would have been equally wonderful! So glad I found your site! I have a question about the coconut cream… becaus eof another persons comment about it not baking well. I just want to clarify that it’s canned coconut cream and not canned coconut milk for this recipe. Thanks!!! I followed the recipe exactly and it came out nothing like the photos . The blueberries didn’t sink to the bottom and the top is convex like a typical cake, not concave like yours. The icing also didn’t get thick. I don’t usually have issues with recipes, so this is unfortunate. The cake just comoletely sucked up the icing. Hope it tastes okay. It’s for my husband’s birthday. Would this keep well if I want to make it a day ahead of time? How would I store it? Wait to put glaze on until a little while before eating? I want to make this in a bundt pan. Any measurement changes I should make? I want to make this I. A bundt pan. Any measurement changes I should make ? It is delish. For some reason the glaze didn’t turn like the picture but the cake is AMAZING. Thanks!!! Hi! 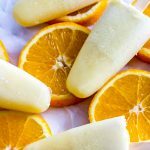 Could I use dairy free yogurt instead of coconut cream? I am planning to make this tomorrow so I hope I hear back from you soon!! I have a 15 oz. can of coconut milk which has partial thick cream separated from the milk. I also have a 15 oz. can of all coconut cream. Which do you suggest using for this recipe? Also, do you think I could sub Miyoko’s vegan butter instead of the coconut butter when making the glaze? Can of coconut cream. 🙂 You could try with vegan butter but I am not sure since I’ve never used it in this recipe! I made 2 of these cakes for a large sandwich cake and followed the recipe to a T but unfortunately both came out really dense, after a day or so the centres were almost brick-like haha. Do you have any idea where I might have done wrong to cause this? 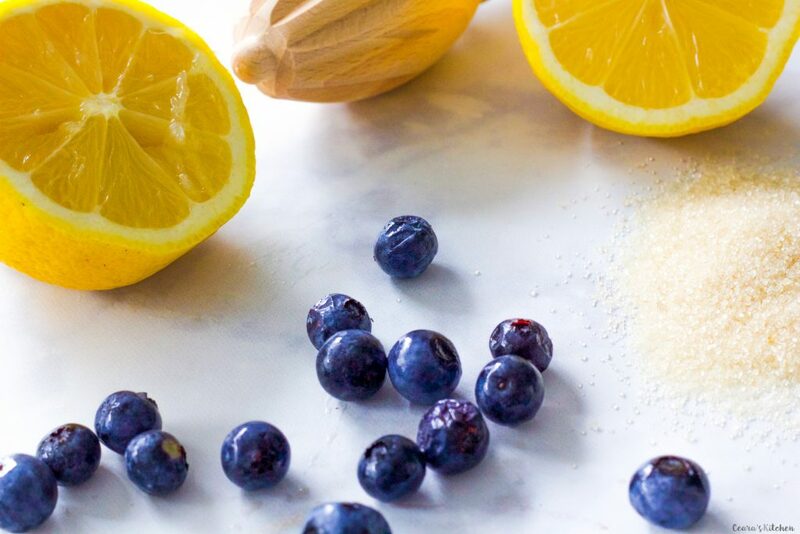 Such a simple, good basic Vegan Lemon blueberry cake recipe. Very moist, very flavorful. Thanks for sharing this nice cake recipe. I made this for my grandkids and it was a huge hit! I used coconut sugar though and the color of the cake was a beautiful brown 🙂 thanks for this great recipe! I will be making it again. Would temp or baking time change if made cupcakes instead? Hi Ceara! Thank you so much for the recipe! However, the cake turned out to be too sour 🙁 Is it possible that I used half lemon juice and half lime? Hi! Is this supposed to be refrigerated or can’ it be left out? I followed the recipe exactly and my cake isn’t cooking. It’s been cooking for 50 minutes and is still gummy inside. It does call for coconut cream, not coconut milk right? I actually just made this cake today and I also had to bake it a little longer. Not quite 50 minutes maybe about 45 or so. This looks delicious! Do you have a recommendation to sub for the coconut (I’m allergic)? Thanks! Hi Amber, I just made this cake this morning. I didn’t have coconut cream, so I made my own not-so-heavy cream by mixing 1/2 cup melted vegan butter with coffee creamer to make the recipe’s 1 1/2 cup. I know, sounds weird, but it worked beautifully. The cake didn’t have any coconut flavor, but my kids don’t like the taste of coconut anyway. We love love loved it! I used gluten free flour. And earth balance vegan butter. I made this for my boyfriends birthday and it was delicious! The only thing I changed was the flour. I used bobs unbleached cake flour. Can’t wait to try this recipe tomorrow! Can I replace the whole wheat white flour with white flour? what is the difference between coconut oil and coconut butter. my coconut butter is really hard and when I try to melt it it turns color and won’t really melt. wondering if using the coconut oil would work the same. I used coconut butter and also tried heating it to melt it. The brown color is it burning. I threw out the burnt butter and started fresh, putting some in a cup and putting that cup in a bowl of hot water while pressing it on the sides to make it pasty, for about 5 minutes. When I whisked it with lemon juice and sugar, it came out perfectly, even though it seemed like it’d be dry. Hope this helps. This recipe looks so delicious! I can’t wait to try this in my own kitchen! Thank you! Let me know how you like it. Enjoy! Just need to clarify regarding the 1.5 cups of coconut cream — I have a few cans in the fridge; should i use only the white hardened cream part – (which would mean using roughly 2 cans). Or, should I use a can of full fat coconut milk (room temp)? This was soooo delicious. The lemon and blueberries was a great combo . Very moist – we couldn’t wait for it to cool down to pour the glaze on and we ate it warm ! One of my fave cake recipes now! This looks really tasty! Do you think a substitution with a gluten-free flour would work?